Shaved ice from 17°C Dessert Café took over Instagram recently after they opened over the May long weekend. If you’ve been reading my blog long enough, you’ll know that I hate line ups so obviously I wasn’t the first one there but thankfully I was invited by ChineseBites for a private tasting. Yay! This entry was posted in Cafe/Bakery, Desserts and tagged desserts, mango tapioca, parfaits, shaved ice, watermelon. I saw before that Styo had a SocialShopper deal going on but I didn’t get it because usually whenever I buy these deals I don’t end up using them but I think I could’ve in this case! Styo serves froyo parfaits and other froyo desserts as well as waffles and smoothies. I like how they have a blue theme going on since I’m super biased and blue is my favourite color. Seating is pretty minimal though. 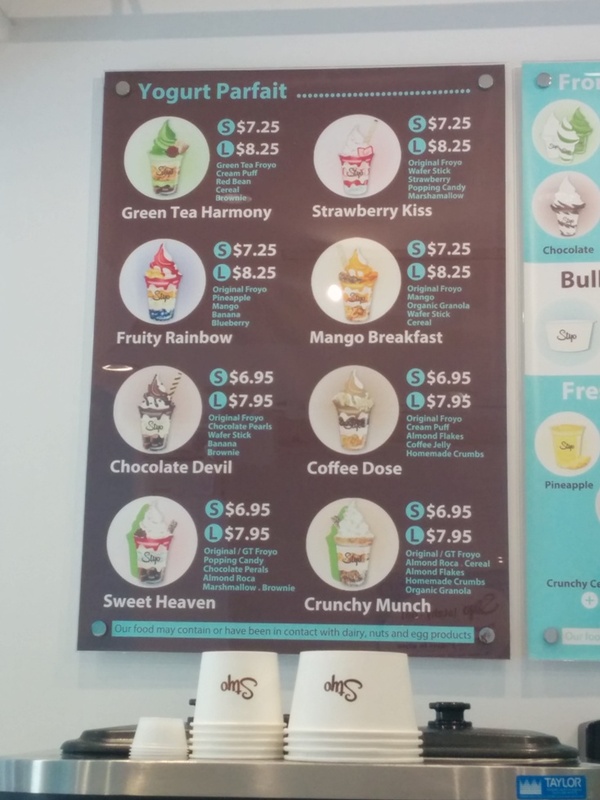 This entry was posted in Desserts and tagged froyo, frozen yogurt, green tea, parfaits, red bean, waffles. So I was at Richmond Centre and obviously I’m going to end up craving something from their new food court. I was on my way to the washroom and spotted parfaits from Umi Express. Or well the little counter beside it that also serves shaved ice. My shaved iced days are over so the parfait seemed like a nice sweet option. Furthermore, the picture didn’t make it seem all too big either. They have four flavours: Anmitsu (green tea & red bean), Strawberry, Chocolate and Mango. 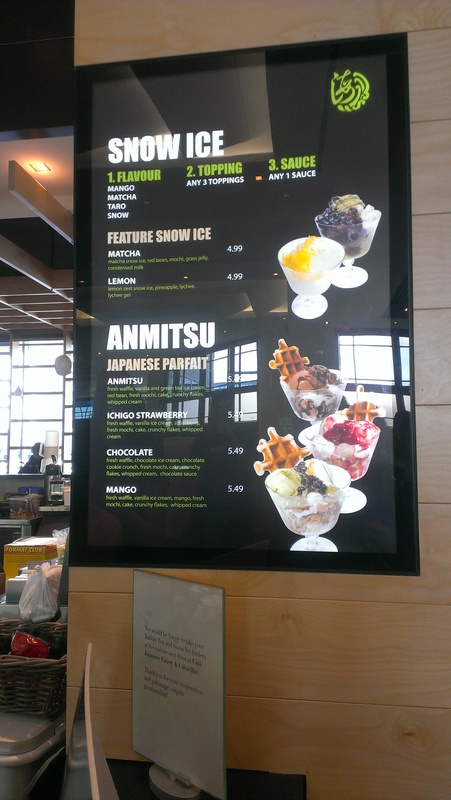 I was debating between the Anmitsu and the Chocolate and ended up going for the Anmitsu with “fresh waffle, vanille and green tea ice cream, red bean, fresh mochi, cake, crunchy flakes and whipped cream”. So first of all they put in the sponge cake and add a layer of corn flakes and then whipped cream around the edges. They also pour in a sweet syrup. Then they add more cake and corn flakes and some kind of jelly. The box she got it from was labelled aloe. Then there was more cake and flakes and whipped cream. 3 mochi balls were then put on top along with a scoop of vanilla ice cream and green tea ice cream. The “fresh waffle” was prepared already and just heated up in a toaster and put on top. 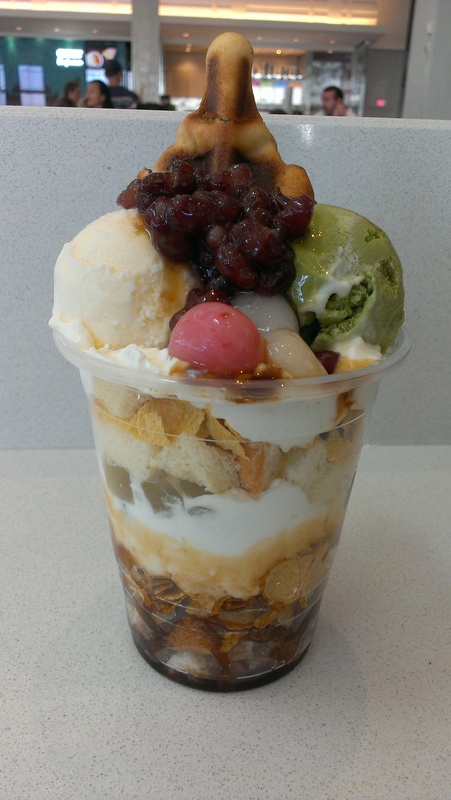 A scoop of red bean and more sweet syrup completed this parfait. It was really not bad for a food court and it was a good size but it was just way too sweet after. Maybe I’ll give the other ones a try since they probably don’t use the same syrup? This entry was posted in Desserts, Food Reviews and tagged desserts, parfaits, Richmond Centre, Umi Express.